← “CLEAR DAY” A CLEAR WINNER! With a Manhattan skyline backdrop, a beaming Jonas has the ultimate grand entrance as window-washing Finch descends from the heavens on his scaffold for the lively title tune that opens the show amid the hustle and bustle of busy employees at the corporate headquarters of the World Wide Wicket Company. In that opening number his solid singing voice was a pleasant accompaniment to his boyish good looks and radiating charm. Those assets will no doubt assure future audiences a fair share of teenage girls and adult “cougars.” Meanwhile, popular newscaster, Anderson Cooper, adds a comical touch. While Cooper does not appear on stage, it is his recorded voice that supplies the amusing voice-over narration of text each time Finch is reading himself a passage from his little how-to book. Another bit of comedy is supplied each time Finch momentarily freezes gleefully in a bright spotlight whenever he gains a sudden insight into how to gain advancement in the company. Jonas carries off those impish bits of comedy flawlessly. 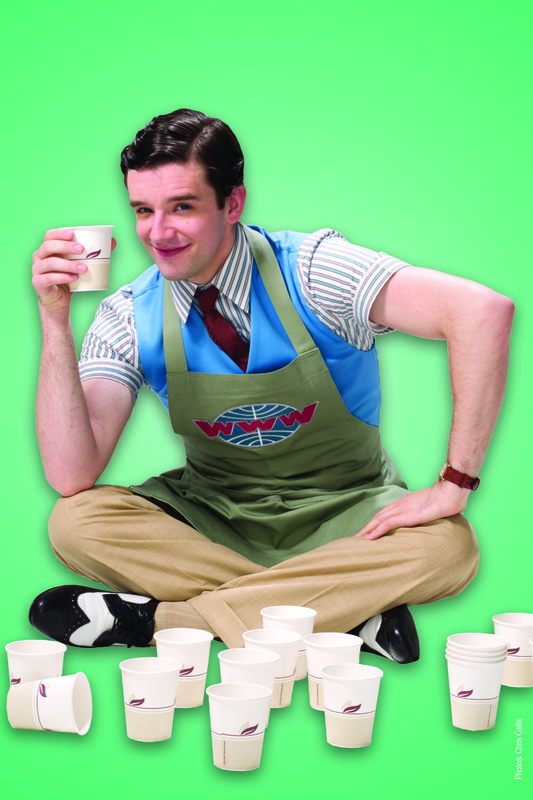 Serving up assorted roadblocks to Finch’s success is one Bud Frump (Michael Urie of TV’s “Ugly Betty,” also new to this cast). 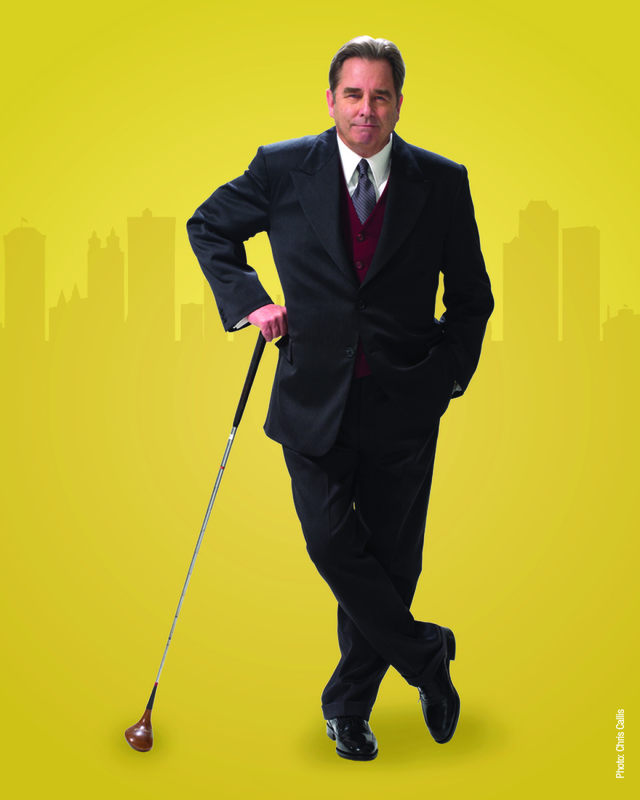 Frump is the lazy nephew of company president, J.B. Biggley, (Beau Bridges), and feels his family connections should be reason enough for his advancement in the company ahead of Finch. Mr. Urie has been given perhaps too much latitude for heavy-handed comedy by director/choreographer, Rob Ashford. Urie supplies plenty of zany comic moments, but seems to work too hard at it, as though the audience wouldn’t be bright enough to get the jokes, and might prefer a cartoon character instead. 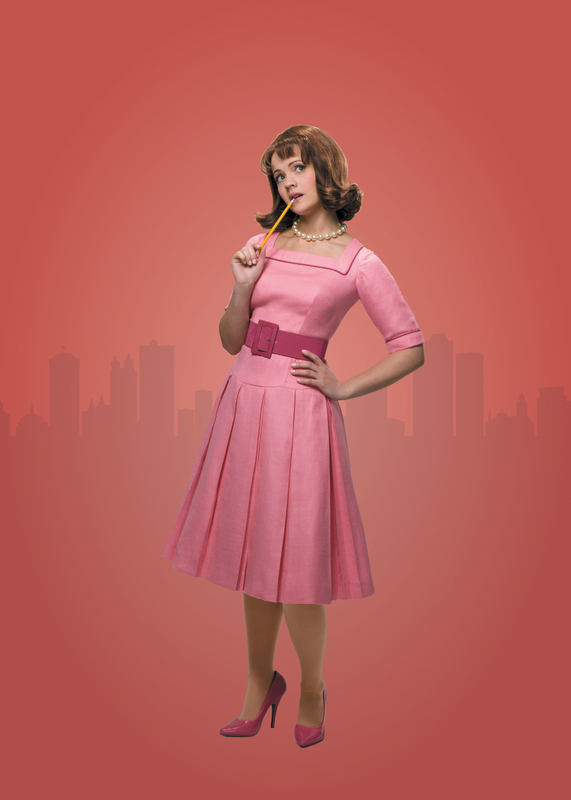 A softer touch comes from Rose Hemingway in the role of Finch’s ultimate love interest, Rosemary. Her sweet, lilting delivery of “Happy to Keep His Dinner Warm” reveals her crush on the ambitious Finch, as well as her hope for suburban married life. Another bright spot in the production comes from actor/comedian, Rob Bartlett, known to many for his association with the IMUS in the Morning radio program. 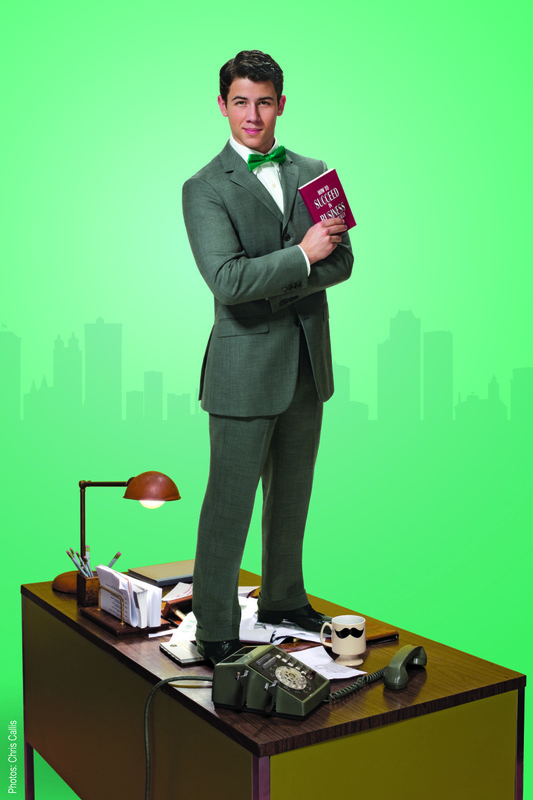 Here he cheerfully plays mailroom supervisor, Mr. Twimble, and knocks one out of the park as he joins Mr. Jonas in a polished duet of the “Company Way,” while they are surrounded by more wandering choreography from the mailroom clerks. The comic characterization of Ellen Harvey as Biggley’s tough-as-nails secretary, Miss Jones, added to the fun and reminded one of comedienne, Eve Arden. And speaking of secretaries, there are plenty. 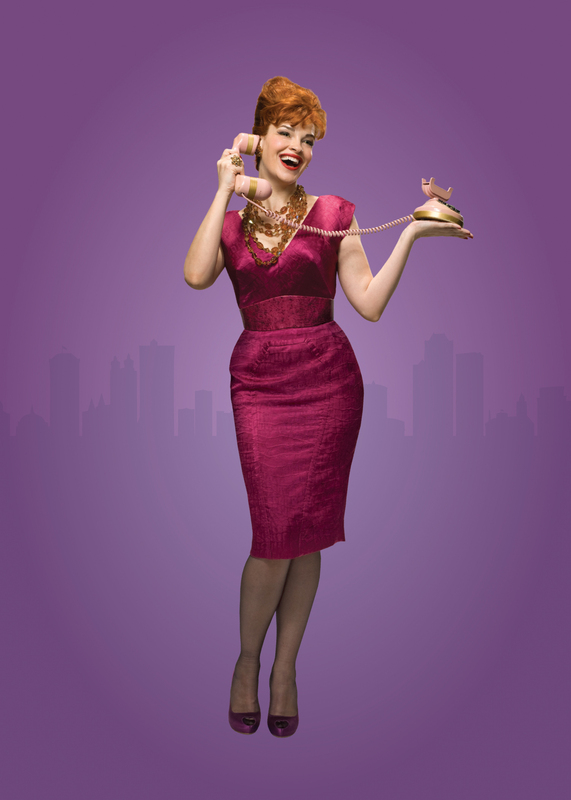 We have Rosemary’s ditzy friend, Smitty (Mary Faber), and married Mr. Biggley’s girlfriend, the sassy floozy, Hedy LaRue (Tammy Blanchard), who Biggley would like to place on the company payroll. Aimless choreography continues to rule the day as the brash personnel supervisor, Mr. Bratt (Michael Park), cautions his staff while leading the ensemble in the rousing, “A Secretary is Not a Toy.” The dancing is no less disorganized when our adorable Finch tries to convince Biggley that they are graduates of the same college, “Grand Old Ivy,” and this rah-rah fantasy segment brings on the lumbering college football team to stomp around the singing duo. Act Two opened with the toe-tapping secretaries offering lively relief in a “Cinderella Darling” that featured both pleasing choreography and more colorful costumes for the gals. But the dated and plodding plot of this 1961 show slows the progress. There was still some pirate quiz show nonsense to endure, as Finch becomes an executive with fresh ideas in the company’s Advertising Department. But eventually Mr. Jonas leads the cast in the familiar hit, “Brotherhood of Man.” The audience looked happy, so hopefully the cause of brotherhood had been advanced. 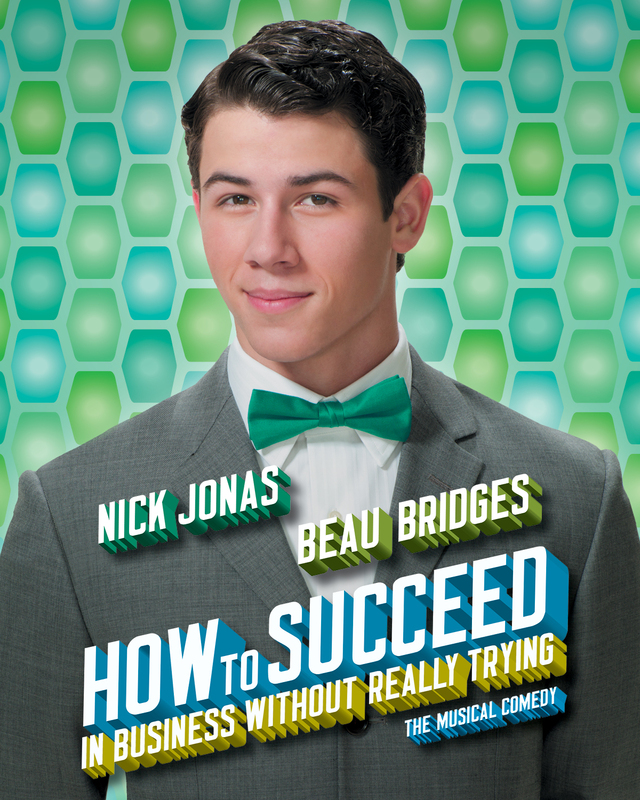 HOW TO SUCCEED IN BUSINESS WITHOUT REALLY TRYING has music and lyrics by Academy Award and Tony Award winner Frank Loesser, and a book by Abe Burrows, Jack Weinstock and Willie Gilbert, based on the book by Shepherd Mead.. Tickets range from $52 – $132, and are available at the Al Hirschfeld Theatre box office and at Telecharge.com (212-239-6200). The playing schedule is as follows: Tuesdays and Thursdays at 7pm, Wednesdays at 7:30pm, Fridays, and Saturday at 8pm, with matinees Wednesday and Saturday at 2pm and Sunday at 3pm. This entry was posted in Broadway, BroadwayStars.com, Miscellaneous Reviews, Theater Reviews, ThePeoplesCritic.com and tagged Broadway, Celebrities, Entertainment, How To Succeed In Business, musicals, New York, Nick Jonas, plays, Reviews. Bookmark the permalink.